If you have a book you’d like me to review, please see the submission guidelines here. The Severed Oath is the second book of The Undying Empire series by Andrew J. Luther, of which three novels are now available. 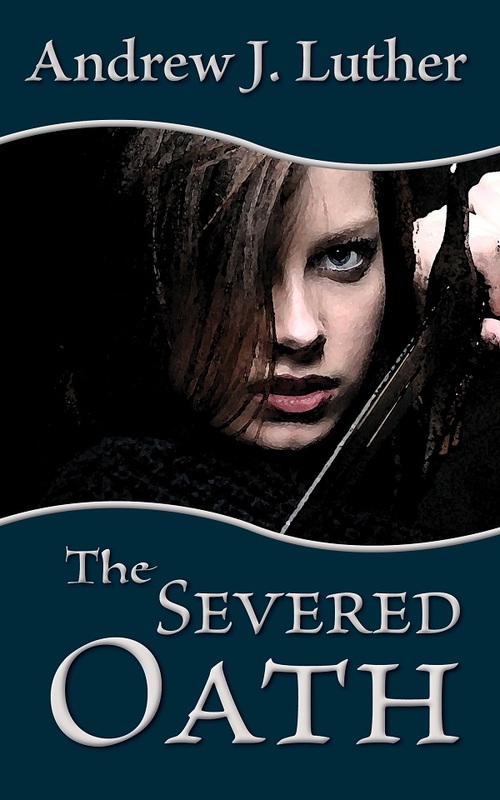 However, the three work as standalone novels, so I’m only reviewing The Severed Oath here. Leyndra is a Guild-trained Warden, a bodyguard given mystical abilities in order to protect her ward. She works for the nobleman Osho, a successful businessman for whom she has a high regard. Despite Osho’s wife’s, Tyina’s, suspicions, there is nothing romantic about their relationship—Leyndra is a professional, and her affection for Osho is, at most, sisterly. Leyndra’s situation is contentious, but safe, until someone sends shadows to attack Osho in his sleep. Despite Leyndra’s skill and powers, she is tricked into seeing shadows where Osho stands, and it is her sword that ends his life. She is immediately branded as an Oathbreaker as the magic of the Guild marks her face, and hauled off to prison, first by the Watch, and then by the Imperial Guard. Planted evidence confirms her guilt, though she tells the true story even under torture. Even if the Emperor believed her innocent, the only ones in the city of Ythis capable of such magic are the sorcerous Five or the church of the mad god, and the Emperor does not dare confront either of them directly. So Leyndra is sentenced to be executed. But Leyndra is not without friends. Jeyrra, the boss of a criminal gang, has resources, even in the Imperial Guards’ prison, and she makes arrangements that give Leyndra a chance to escape. Even weaponless and naked, Leyndra still has the virtus, the source of a Warden’s power, power she should have lost when she became an Oathbreaker but somehow didn’t. Leyndra is soon free to hunt the dark power that killed her master and framed her. She is assisted by Jeyrra, and oddly, by the Watch Sergeant Lumayth, one of the few honest men of the Watch, who believes her story and wants to figure out what really happened as much as she does. Together, they hunt down a corrupt nobleman and the necromancer he serves. One place where the novel is weak is in the plotting by the necromancer. It’s asserted that it’s very dangerous for the necromancer to set up shop in Ythis, where the Five and the church would destroy him if they discovered him, but it’s never made very clear why he needs to be in Ythis. It’s said that he needs to stay until an item he desires is delivered, but there’s no real reason that the item needs to be delivered in Ythis rather than some other town. And the whole murderous plot that draws Leyndra in has more to do with money than anything specific to Osho—surely there are easier ways to raise funds for a necromancer who knows the secret of immortality. There would be more than a few buyers willing to pay any price asked for that secret, in any city. Getting the nobleman involved, and relying on murder and adultery as the means to raise the funds, just seems like an unnecessary complication, and I think that a little bit of work could have been done by the author to shore up the scheme and make it a bit more grounded. If the nobleman had been made more necessary somehow, the plot against Osho could have been understandable given the nobleman’s relationship with him, but I have a hard time seeing why the necromancer needed that particular nobleman in the first place, enough to travel to a city filled with powers that would kill him, and use his magic in ways that were sure to bring attention in order set up a convoluted plot. Now that my main gripe is out of the way, I must say that I enjoyed this story for the most part. I liked Leyndra, and her friends, and the balanced switching between points of view let me grow attached to characters even when they rarely intersected with Leyndra herself. The nobleman was appropriately conniving, the necromancer evil, and I could appreciate them for what they were. The one character that I really didn’t like was Leyndra’s younger brother, Morit. He was a coward, and deliberately so, but while his cowardice was difficult to swallow, he did not deserve all the things he suffered. It was hard to read his point of view sections, as they elicited a weird mix of dislike and pity. Courage and cowardice were among the themes of the book, as was Leyndra’s sense of responsibility: her responsibility to avenge Osho’s death, for her brother and the situation she’d put him in, for her friends. However, it’s also implied that her smothering care for her brother while growing up parentless is part of what made him the way he is. So letting go of responsibility is also a theme, though that doesn’t stop her from seeking revenge—which is good, as Leyndra walking away from the necromancer’s plots would have made a much less interesting story. There is an implied sequel, as Leyndra takes over the expedition the necromancer arranged through his corrupt nobleman ally. I’m not sure whether the third book in The Undying Empire really fulfills this role, but I’d be interested in finding out. The Severed Oath is available for $13.99 for the paperback from Amazon, $4.99 for the ebook from Amazon, Kobobooks, Smashwords, DriveThruFiction, and iTunes.